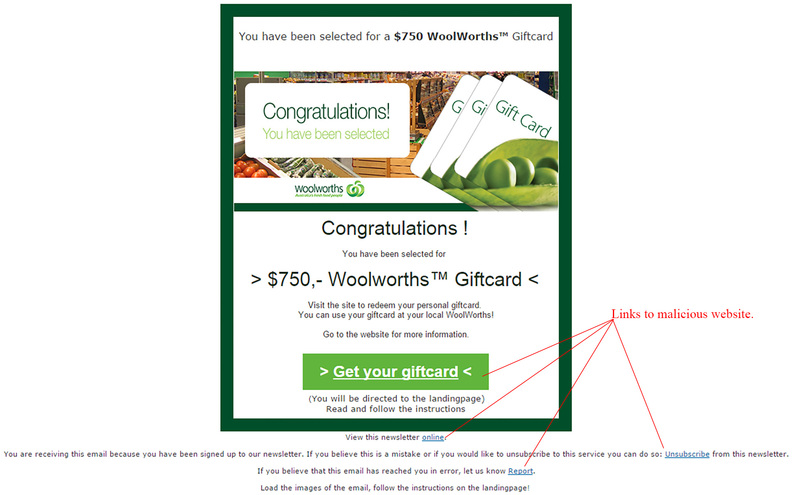 Another gift card scam has been detected by our filters, this time targeting Australian supermarket franchise Woolworths. The email pushes for you to visit the website to get the gift voucher, however be warned your computer will be infected by malware. If you receive this email delete it from your inbox. Figure A provides an example of the email scam. The subject line reads ‘”Congratulations! Your WoolWorths giftcard”. The overall design of the email is done well to trick the receiver into believing it is legitimate, however there are clear signals of its true nature. 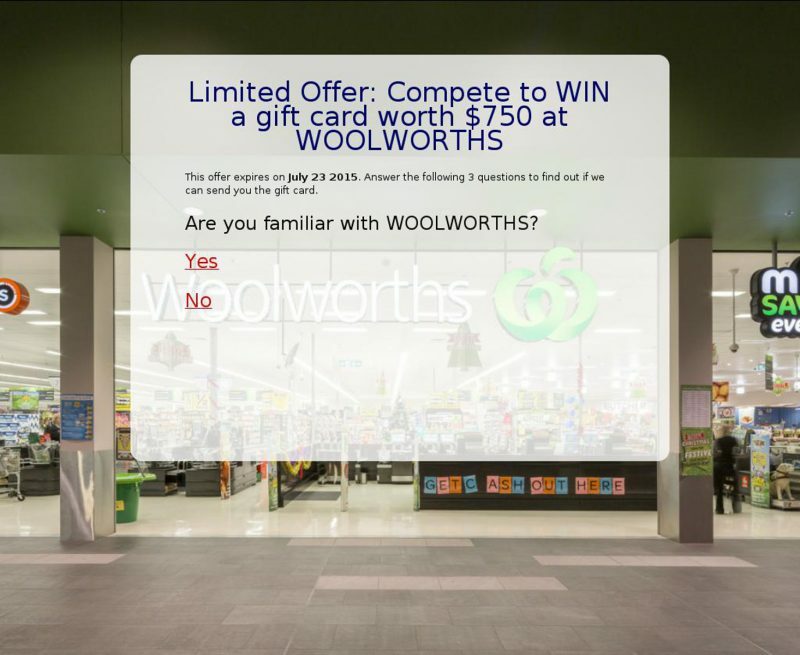 By hovering over the links in the email you can see they are suspicious and do not go to the official Woolworths website. There are also clear spelling and grammatical errors – simple mistakes Woolworths would not make. No personal greeting is another sign that it is a mass email sent to hundreds of people to trick them into clicking the links. Even the unsubscribe links are malicious – do not click any links in this email. We were able to safely click through for a better look at the next step in this scams process. You can see in Figure B the site instructs you to answer questions to receive the gift voucher. Do not go any further if you see this page. Completing the survey will infect your computer with malware. If you were tricked into going through to this step, close the window immediately and be sure to verify your Anti-Virus and/or Anti-Malware software is up to date and run your Anti-Virus and/or Anti-Malware software immediately. Keep an eye out for gift card scams in the coming days, we have noticed they are on the rise. Do not open any suspicious emails that may reach your inbox. If you receive this one delete it immediately and do not click any of the links inside.